Today marked a milestone in TriMet’s accelerated bus replacement program. The first five of 22 new 30-foot low-floor buses went into service this morning. These shorter buses, known as the 3400 series, are replacing our oldest buses that have been in service since the early ’90s. They come equipped with air conditioning and ramps, features that will improve the ride for our customers. The 3400s will be used on routes where the turns and terrain require a shorter bus. Riders along three routes, the 39-Lewis & Clark, 51-Vista and the 152-Milwaukie, are the first to experience the new vehicles. These lines operate out of our Center Street garage but over the coming months new 30-foot buses will be assigned to lines out of our Merlo and Powell garages as well. Riders will experience the same features they’re enjoying in our latest buses including next generation GPS/tracking system for better customer information, automatic stop announcements, air conditioning, low floor boarding for easy access, exterior “porch light” above the front and back door, and easy-to-clean vinyl seats and interior surfaces with an anti-microbial finish. 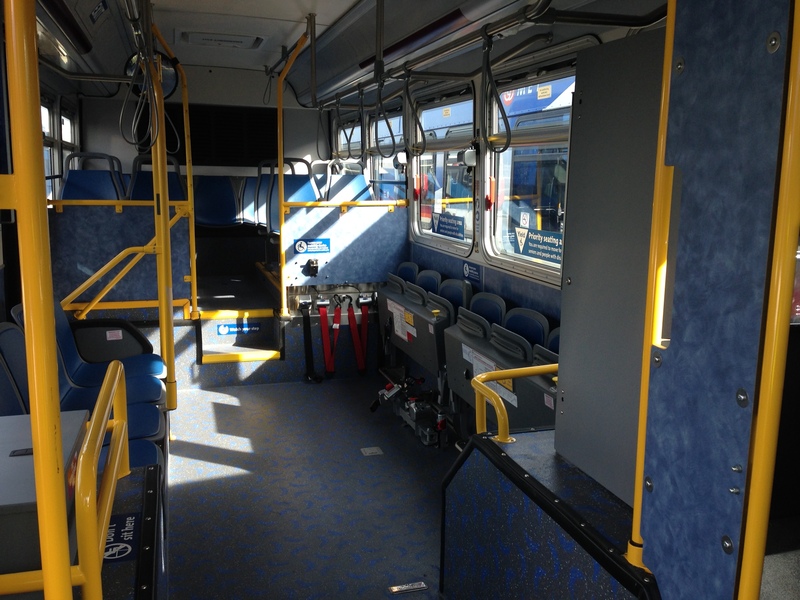 The operator’s compartment received a few ergonomic design upgrades, including relocation of switches, thanks to changes led by TriMet’s Bus Operators Continuous Improvement Team. The 15-member TriMet team recently won a Safety and Health Advocate award at the 2015 Oregon Governor’s Occupational Safety and Health (GOSH) Conference for their contributions to workplace safety and health. The 3400s come from the Gillig factory in Hayward, California, the same manufacturer that built our other newer buses. The cost is $447,875 per bus. We continue to accelerate our bus purchase program with 77 new buses in the proposed fiscal year 2016 budget. 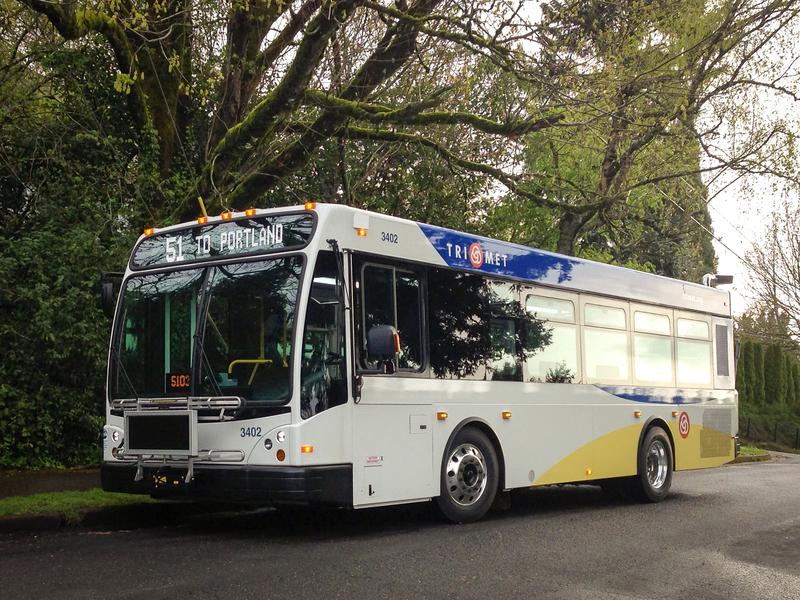 By the end of FY2016, which begins July 1, 2015, TriMet will have a total of 326 newer buses on the road and will meet the industry standard of an average age of eight years. In addition to improving the ride with new buses, we continue to expand bus and MAX service. This next fiscal year will see bus service hours increase about two percent, and will mean that we will fully restore the Frequent Service bus network with the addition of frequency on Sundays. MAX service hours will increase 15 percent, with much of it – $8.5 million – funding the new MAX Orange Line. About $1.1 million will fund the restoration of weekend MAX Frequent Service. More about our proposed FY2016 budget and service expansion at news.trimet.org. We know our riders want more and better service. That’s why, over the next few years, we’ll continue to grow our network of buses and trains—while improving the overall rider experience. New transit projects, such as the Portland-Milwaukie MAX Line opening in September, will provide riders a much-needed alternative to sitting in traffic. Meanwhile, ongoing upgrades to vehicles, stations and tracks are helping to improve reliability and make your ride more comfortable. And, we’re improving our trip tools so you have access to service information when and where you need it, along with a new and convenient way to pay your fare via mobile ticketing.